Born on the faraway planet Jewpton, Afikoman was sent to earth as a baby Matza so he may one day salvage the Jewish people from their Jewish mothers. 30 Passovers later, Afikoman is ready to fulfill his destiny! 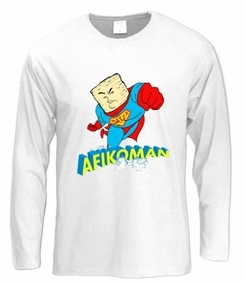 Get this epic Afikoman T-shirt and Join Afikoman on the ultimate Passover quest! Our t-shirts are made of 100% cotton and are long lasting with bright colors. Our products are all designed and printed in Israel.